Scone Boys’ Brigade raised £278 for Giraffe, a Perth-based not-for-profit company which offers employment activities to people with mental ill-health, disabilities and other disadvantages in the workplace. 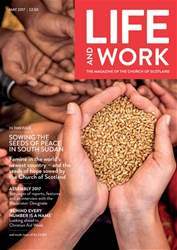 The month of the General Assembly of the Church of Scotland will be almost upon us as this issue reaches our readers. Reports will be debated and pronouncements made on a wide range of issues. One thing will be evident: the wind of change will begin to blow over the shape of the Church. After a series of roadshows over the length and breadth of the land from London to Lerwick the feedback on the future of the Church is being carefully analysed and considered.